Macphun is billing its Luminar 2018 editing software as "the first real Adobe Lightroom alternative"
Adobe’s ubiquity in the world of photo editing is well known. ‘Photoshop’ has followed in the footsteps of ‘Hoover’ to go from being a specific brand name to a genericised trademark – ie a catch-all term for products in its class. 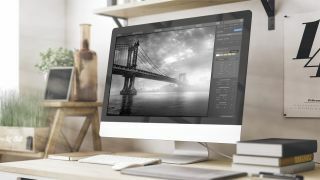 The company's Lightroom program is currently the software of choice for many enthusiasts and professionals, but software company Macphun hopes that its alternative offering will soon change this. The company, which is in the middle of a name change to Skylum Software, has thrown down the gauntlet to Adobe and unveiled its Luminar 2018 software, an all-in-one app designed to offer photographers everything they need for photo editing. Given that Adobe Lightroom has become just as loved for its intuitive image editing as it has for its useful cataloguing and organising abilities, any software aiming to take it on needs to provide both – and things look pretty good for Luminar 2018 so far. Luminar 2018 packs a new Raw develop module, which is designed to handle large, high-resolution images quickly and efficiently, with Lens Correction and Transform tools available to help streamline the tedious stuff. It's also overhauled the user interface to make it easier to browse and implement new intelligent filters and over 100 presets, while a free update in 2018 will see a new image browser and digital asset manager for efficient organisation of image libraries. Several features from previous iterations of the software are also said to be improved, including masking with filters, Bi-Color Toning, Cross Processing, Image Radiance, Structure/Microstructure and Split Toning. The approach very much seems to be gearing towards photographers who want their editing to be streamlined and simple, with the promo video below showing a user clicking a button simply labelled ‘Quick & Awesome’. Macphun Luminar 2018 is available now for Mac and Windows. New users can buy it for £64/$69, while existing Luminar users can upgrade at a discounted price.